Both bathrooms and the cloak room have recently been refurbished to a high standard. The family bathroom has a full length bath tub and power shower cubicle, the ensuite bathroom also has a power shower cubicle. There are bidets in both bathroom. The cloak room is modern style and located on the ground floor. A dining area is located next to the conservatory and another dining area is situated on the outdoor decking, overlooking the river complete with sun awning for sun shade. Balcony/decking area overlooks the River Thames. We had an absolutely lovely week at Pixie place for the family over the Christmas period. There are some nice country walks ( slightly muddy due to weather) but still enjoyable. The house is in a very quiet area and all the neighbors seemed to be friendly when we met in passing. There’s ample parking for up to 4 cars. The house is also fully equipped with everything you would need for the course of a week if we had still been at home. The owners and all involved were friendly and helpful and we would all happily recommend the property. Thanks again for a lovely relaxing week. We are delighted you enjoyed your stay. Thank you for your review, you were great guests and we hope you will choose Pixie Place on another occasion.. Perfect house and location for a relaxing break! Pixie Place met all our aspirations and more. We wanted somewhere as a base for Windsor and London but also somewhere to chill and do absolutely nothing! We loved the location especially the cooling effect of the close by water – we stayed in the 35C/95F heatwave week. We had absolutely no traffic problems, even with a road closure in the centre of Windsor and often travelled the 20mins to Slough for trips into London. The close by Co-op was perfectly suitable for a full shop or top up. We had a Tesco delivery and just popped into the Co-op on the way back from days out. Amazon Prime also found the place without a problem. We ordered a delivery for five from the nearby Italian ‘Punto’s’ and this was delivered in exceptional time. Internally, every room is beautiful and fully equipped – our younger people were happy with the internet and that is their sole requirement. Just watch for the glass coffee table at shin height!! Assaulted me loads of times but no one else! May be I was just too busy looking out of the windows at the great view. Nael and Angela are excellent hosts and were quick with answers to any ‘how do I?’ queries. I suppose the perfect recommendation is that we would happily reuse the property. My abiding memory will be chilling on the decking with a beer while watching Heathrow’s planes with Flightradar24 on my IPad – my perfect antidote for a busy life. Thank you for taking the time to write such an extensive and positive review. 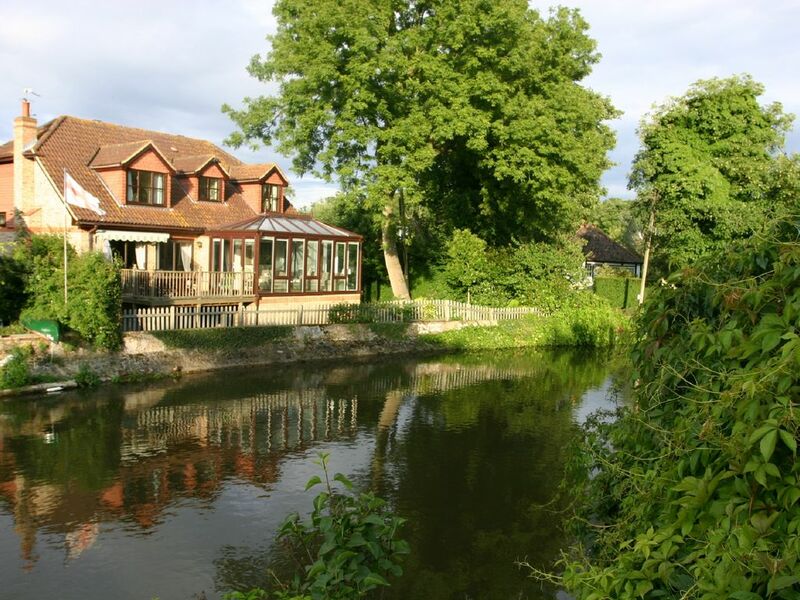 We are absolutely delighted you loved our beloved riverside home and its' beautiful surroundings as much as we do. We would love to welcome you and your family back any time, you were great guests. We needed a home for a family gathering during February. Pixie Place was ideally located, and the large open plan lounge/diner was ideal. When we arrived everything was spotless, and the quiet (apart from aircraft noise, which we always quickly forget about) location by the river was very pretty. Facilities were excellent, although the oven defeated our best efforts to get it working, and the interior was warm, bright and comfortable. Nael was very helpful throughout, and returned our deposit promptly. There is much to see and do in the area, and although we used to live around here it was great to re-acquaint ourselves with Windsor and the Castle. The cafe and shop at the Royal Windsor Farms Shop are well worth a visit too, and are close by. Would be a great location for trips into London as well. WE are so pleased that our guests enjoyed their family get together in our spacious house. It is ideally suited to explore the surrounding areas of Windsor itself and so many places of interest including London. We hope to see our valued guests again in the future. Great house that suited our needs well being in an ideal location for exploring Windsor and taking the train into London. Nael and Angela are very helpful and caring owners. Thank you for your visit and for your review. We are delighted you had an enjoyable holiday in our beloved Pixie Place and hope to host you again in the future, you were great guests! We are a family of 4 and were looking for a central, but comfortable, place to start our UK holiday. Pixie Place was ideal for those of us heading in to Windsor and London - including evening shows - and for those who wanted to hang out sometimes instead. Well-appointed with lots of nice touches & great recommendations by the owners & property manager - a real attention to detail all through our stay. We hope to be back! Thank you for your visit and for taking the time to write such a lovely review review ! your holiday in our beloved Pixie Place and all that the house and Royal Windsor had to offer. You were great guests and hope you visit again sometime in the future. Hi both, thanks for sharing your home with us. To any would be travelers you just can't go wrong with pixie place. Hope to return one day best wishes from the Kiwis. Thank you for your visit and review. We are so glad you had such an enjoyable holiday experience in our beloved pixie Place. You were great guests and are welcome back any time. CLASSIFIED AS 4 STAR BY ''VISIT BRITAIN AND WINDSOR MAIDENHEAD TOURIST BOARD'' AWAITING 5* STAR GRADING , Located West london, 15 Miles from Heathrow, Riverside house sleeps up to 7 people, luxurious, very conveniently located for central london with 20 minutes train service, Windsor is the number one tourist location in the United Kingdom. All amenities are within 20 minutes walk and all tourist attractions are within 10 minutes drive. It is a family orientated area, safe, beautiful and very exciting. The most beautiful parks in the United Kingdom are close by. Legoland, Ascot Races, polo matches,Thorpe Park and funfair, open-air ice rink in the winter, the Windsor Eye in season, Botanic Gardens, River Trips to enjoy the wildlife also pleasant walks by the river, traditional English pubs, quaint shopping areas, international restaurants for all budgets as well ascasual dining. Visit Windsor Castle, the Queen's residence. The daily Changing of the Guard ceremony is a must. Other Activities: Windsor Castle, LegoLand, Thorpe Park, River Thames, Ascot Races, Windsor Great Park, Fine dinning, Eton College, historial, Royal Railway Station. Our rates include all costs and utilities which include: Cots and high chairs could be supplied on request and it is included in the rates. The house is ideally suited for a family up to 7. Rates are based on up to 6 people. Last minute offers There is an extra charge of 14 pounds per night per person above 6 people. Car parking is included Cleaning on arrival and departure is included Extra cleaning is available on request There is extra charge of 17 pounds per night for the 7th person.